Have you got New Year's Resolutions? Do you have a heart for kids affected by cancer and want to make a difference? You can do anything to fundraise to help support these champions. Whether you like to run, cycle, bake or you're courageous enough to shave your gorgeous locks - you can do anything your heart desires to be a Heartfelt Hero! Childhood Cancer Support provides a place to call home during treatment, emotional and financial support, transport and recreational therapies. Check out Logan as he takes us on a tour around our Herston accommodation. What’s your one weakness? Is it chocolate, coffee, alcohol or anything sugary? Testing your willpower and taking a break from your vice can help bring a dose of happiness to children facing the toughest of challenges. Are you a bit of a whisk taker and love baking for a good cause? Tie up your apron strings, pull out those much-loved recipes and get baking! You can organise anything as simple as a workplace bake sale or morning tea, to an elaborate bake-off competition or fancy high tea! And of course the calories don't count when it's for a good cause, right? Show solidarity with children battling cancer by shaving your head. Get creative, show your personality and get attention for your fundraising initiative. You might like to just get a trim of your long locks, colour your hair, go short and get a message shaved in your scalp or go complete cleanskin. Do you love rolling up your sleeves and getting practical with your fundraising? You could do anything to provide a service to your friends, family, workmates or local community for a donation. Whether it’s mowing lawns, holding a car wash, washing the neighbours dogs or encouraging your kids to do extra chores for donations. You can go above the call of duty and get busy for a very worthy cause! Instead of getting presents at your special birthday event, why not set up a fundraising page and ask for some heartfelt donations instead? Have you got an idea for your own fundraiser? It might be a Golf Day, Bike Ride or Music Concert. You can set up a fundraising page for your event, customise the look and feel of your page and ask for donations far and wide! 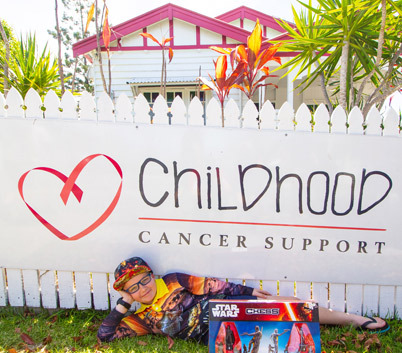 Childhood Cancer Support provides ongoing support for children undergoing treatment for cancer and their families, by providing a place to call home during treatment, emotional and financial support, transport and recreational therapies.